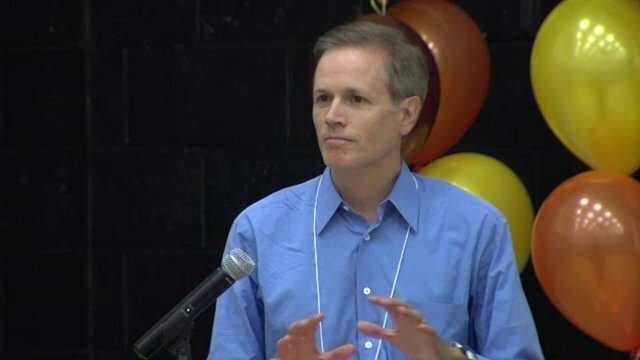 ^ Jim Peyser, education reformer, is Charlie Baker’s pick to get school transformation done. It will not be easy. No sooner had Jim Peyser been named Education Secretary by incoming Governor Charlie Baker than the attacks began. Upon him, upon Baker too. Suddenly the bipartisan Baker became “a Republican after all” — as if school reform were important only, or even chiefly, to Republicans. Peyser’s a no-nonsense guy who means to loosen the rigid parameters of education in Massachusetts — rigidity which brooks no reforms, no imagination to remedy mis-educations of many children in our state. His appointment was certain to bring protest, and it has. Witness the mantra now seen on twitter : “keep public education public.” Or this one : ‘the school privatization movement.” These are poison pills for a mission that needs good health if it’s to achieve its mission. “Public education” is education paid for with public — taxpayer — funds. No more, no less. It is NOT part of the definition of “public education” that public funds be administered and taught only by members of teachers’ unions. Nor is it part of that definition that there be only one publicly-funded curriculum per district, one school day length, one system of staffing, one way of administering, one form of classroom assignment, one transportation method. The only reason that singularity came to be the norm for taxpayer-funded education is that, during the era, over 150 years ago, in which public schools were established, it was bold simply to establish one such system, where before there had been none. And the only reasons that singularity has persisted right up to the present, are that any bureaucracy, once established, tends to entrench; second, because industrial economy favored educating almost everyone in the same way and in the same place. Unity was needed to bind together an industrial nation’s economy. Today, all of that has changed. What is needed is diversity ; because much of today’s workplace today is fragmented into small units of intelligence and experiment. This is particularly true of the jobs that require highly educted entrants. As for mass employment, in service jobs, even they aren’t as ‘mass’ as they used to be, because every service sector requires different specific knowledge : home health aides, fast food workers, retail staff, delivery drivers, and the like. In order to educate children for the aggressively varied workplaces of today (and tomorrow), public funds need to sponsor schooling systems that vary accordingly. “One size fits all” just won’t do. Nor can our state any longer tolerate having staff dictate what is being taught, and where, and how. The big push back arises neither from fragmentation nor diversity but from the fight for funds. The people whose careers and hopes are fully invested in the one size fits all system fear that in the new, diversity system, where school styles are pitted against one another to see which gets the job done best, those schools that don’t get the job done — or are judged by the state education bureaucracy, to not be getting it done — lose funds, whence kids and staff suffer. That, at least, is the argument. Let us look to see if has any benefit. Is there anyone who seriously argues that public money — taxpayer money — should underwrite the invoices of schools that fail ? If so, please step forward and identify yourself. By any measure, some schools are failing. Job postings in all kinds of businesses are going unfilled because not enough high school (or college) graduates in our state have even entry level skills needed to do them. Class size in many schools is too large for even a great teacher to control all. Textbooks are out of date. Many children arrive at school speaking a different language from English. Some have psychological impediments. The Special education law imposes an enormous burden of time upon teaching staff and designers of curricula. Perhaps worst of all, many school systems cannot establish the most basic quality controls. In Boston, superintendent John McDonough has managed with great skill, and fighting the teachers’ Union at every turn, to impose a rule by which every school principal can hire his or her own staff. Why has this even been an issue ? Quite contrary to the mantras being lobbed in all corners of the discussion zone by anti-charter school people, the push for diversity of education initiatives does not come from “the Republicans.” Most Republican-voting communities have publicly funded schools that work fairly well. No ; the push for school transformation comes from communities of color, whose schools are the most likely to be failing; to employ the least effective teachers; to have the poorest equipment. And it comes from the upper-income, liberal suburbs, where school experimentation is seen as vital to the success chances of kids being educated. And now the “school privatization” thing. What this means is, first, that the teaching force, in charter schools, and likely in other experimental school initiatives, are not required to belong to a union; and, second, that the operation of many diversity initiatives will be entrusted to organizations other than the state itself. School unions are right to be upset about having to compete with non-union employees; but they should take it as a challenege, not as doom. As for entrusting the management of some school initiatives to non-profit organizations, why not ? School district administrators have all they can handle — then some — managing standard schools, with all of their staffing, discipline, truancy, work rule, school day, curriculum, school plant, transportation, and school lunch issues. School district administrators must be extremely grateful to have some part of their enormous burden shifted onto other shoulders. It will become quite obvious, as Peyser takes on the challenge of transforming our schools, that who the constituencies for change actually are belies every argument profferred by the anti-reform forces. And if “the Republicans” happen to be right about the need for school reform, and its direction, and that in many cases school employee unions stand doggedly against, then good for “the Republicans” for being correct for once. The fight will be stormy. Last year’s Charter Cap Lift bill failed because, first, it allocated compensation funds to school districts for every child being moved into a charter school, and that compensation formula bears no relation whatsoever to the actual budget consequences of such removal. second, it failed because the Senate version of the bill contained amendments that tied the charter cap lift to preconditions that negated the entire purpose of the lift. These objections were placed in the Bill as attempts to placate the opponents of charter school expansion. Those who prepare the next charter expansion bill should present a bill that serves reform, not anti-reform. Otherwiuse why even bother ? I cannot imagine what it will take, however, to get a useful charter expansion hill through the legislature. Speaker DeLeo, who listens to the constituencies that support school transformation, surely wants such a bill; and usually, what the Speaker wants, he gets. But then there is the Senate, where a new, “progressive” President takes office; and Stan Rosenberg, who represents a union-friendly District in which Baker received lss than 20 percent of the vote, need not fear the Governor’s voters and is unlikely ever to oppose the uncompromising opposition of the state’s teachers’ unions. Jim Peyser has a very hard task ahead of him.